Don’t miss Saturday’s Garden Expo at the Spokane Community College Lair Student Union building, 1810 N. Greene St. This free event, which runs from 9 a.m. to 5 p.m., features 250 vendors selling plants, gardening products, services, crafts and garden art. There will also be free seminars and demonstrations. When it comes to growing veggies, the tomato has to be everyone’s favorite. And why not? The taste of a homegrown, sun-ripened tomato can’t be beat. Right now, I have 20 robust tomato plants in my greenhouse that are eager to be planted in the garden. Much as I’d like to grant their wish, that just about guarantees a late frost. I didn’t go to all the trouble of raising them, only to have them wiped out after one cold night. 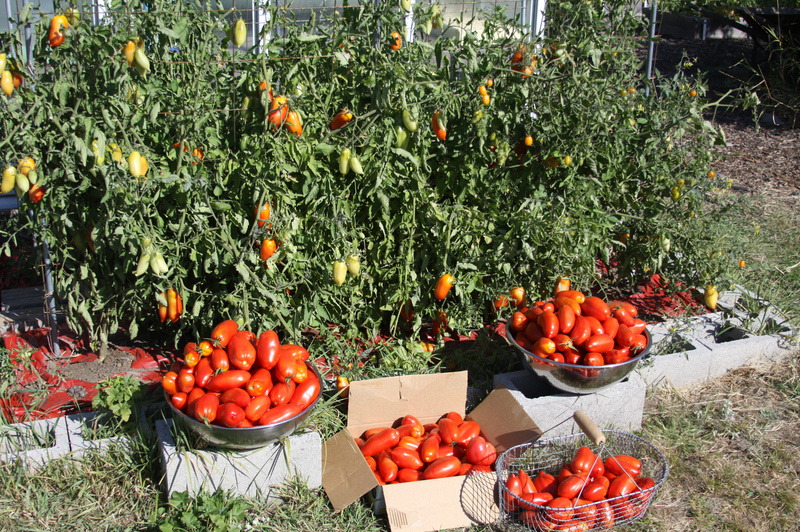 Here in the Inland Northwest, our frost-free growing season typically starts after May 15 but savvy gardeners usually wait until the first of June to plant their tomatoes. I may have said savvy gardeners wait, but that doesn’t necessarily mean I’m waiting that long. There are a few things you can do to get a jump on tomato-growing season and perhaps be the envy of your neighbors by having the first ripe tomato on the block. I always cover the soil in my tomato beds with a layer of plastic to raise the soil temperature, something this heat-loving crop needs. Research has shown that red plastic – often referred to as tomato mulch or SRM red mulch – is more effective in increasing productivity and speeding ripening than black or clear plastic. There are products like Wall O’ Water and Kozy Coats, which are water-holding cylinders of plastic that are placed around each plant. The water gives off heat to protect them from chilly night temperatures. I used them last year and they worked great. I also protect my plants with floating row covers for the first couple of weeks, just in case temperatures dip down a bit. This spun-bonded fabric lets in air, light and moisture while providing a few degrees of frost protection. If you don’t have any tomato plants yet, keep in mind that the varieties requiring a shorter growing season will generally give you the best results. Try to select varieties that mature in 80 days or less. This year, I’m growing Stupice slicing tomatoes, Italian Pompeii paste, Sungold cherry, and Solid Gold and Amsterdam grape tomatoes. When you are ready to plant, remove the lowest pair of leaves from the stem. Plant each seedling deeply, just below the bottom leaves to encourage root growth along the stem. The plants need some type of support. They can be allowed to sprawl along the ground but tomatoes need good air circulation to ripen. In years past, I’ve used sturdy tomato cages made from old field fence. They’ve worked well but I’ve since learned an easier way to support them that also allows me to squeeze an extra plant or two into my raised beds. I use 4-by-8-foot panels of concrete-reinforcing wire and stand them up along the middle of my 8-foot-long beds, supported by metal stakes. I plant the seedlings on either side of the wire. As they grow, I run twine in a big loop around the wire frame to support the plants. Fertilize your plants with a diluted fish emulsion fertilizer every two weeks for the first month. After that, use an organic fertilizer that is low in nitrogen and high in phosphorus and potassium, according to the label directions. And stand back. Susan Mulvihill can be reached via email at inthegarden@live.com.Visit her blog at susansinthegarden.blogspot.com for more gardening information, tips and events.